A Winter Storm Warning - 3PM Wednesday to Noon Friday - remains in effect for areas along and north of a line from Canby to Litchfield to Cambridge, starting this afternoon and lasting through Friday morning. A Winter Weather Advisory - 3PM Wednesday to 6AM Thursday - has been issued to the southeast of the Warning, down to a line from Redwood Falls to Glencoe to Bloomington in Minnesota, continuing to Hudson to Menomonie to Chippewa Falls in Wisconsin. Snow will begin advancing into southwestern Minnesota late this morning, with intensity increasing by evening. Snow, possibly heavy at times, will continue through late tonight before intensity tapers off Thursday morning. Occasional light freezing drizzle is possible but not expected to make a major impact as compared to the snow. Total snow accumulations of 7 to 12 inches are likely in the Warned area where little to no rain is expected. In the Advisory area, warm air aloft will surge northward late tonight through Thursday which will turn the snow to rain until Thursday evening, cutting into the accumulations and potentially watering them down and diminishing them during the day Thursday. Total snow accumulations in the Advisory area of 2 to 4 inches can be expected. Here's the weather outlook from PM Wednesday to Friday, which looks fairly unsettled as our next storm systems blows through. Areas of rain, snow and even some freezing rain will be possible. The heaviest snow looks to fall across parts of North and South Dakota into central and northern Minnesota. 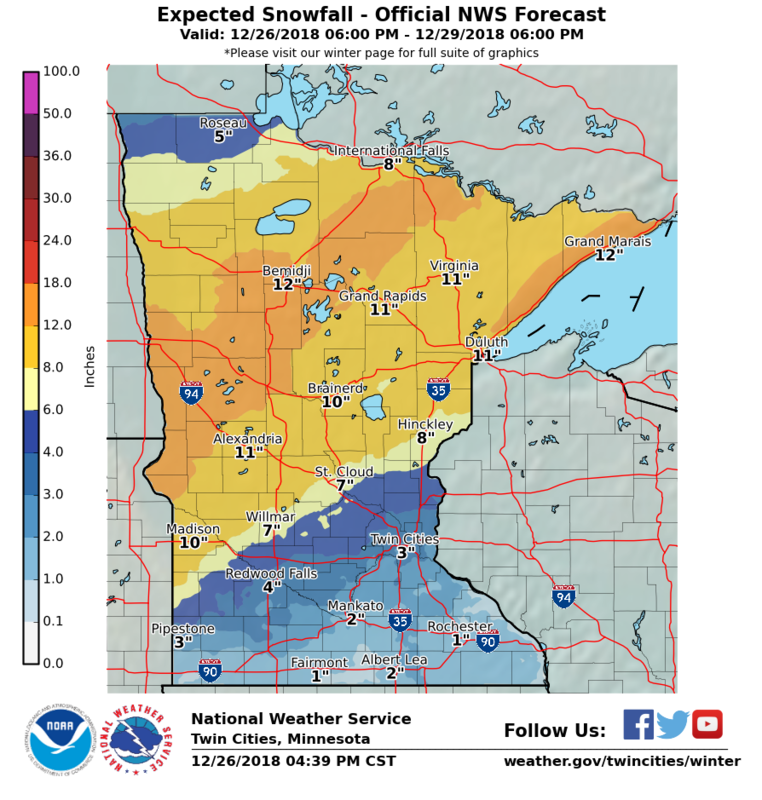 Here are the latest numbers from the National Weather Service, which suggests the heaviest snow (up to 12"+) falling across much of central and northern MInnesota. Note that the Twin Cities will largely get missed by the heaviest stuff. Here are the latest GFS and ECMWF model outputs for snowfall through AM Saturday. 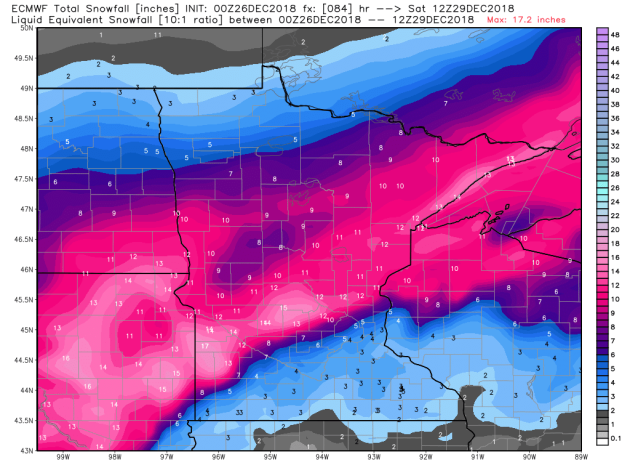 Both models show the heaviest band setting up northwest of the Twin Cities with some 12"+ tallies possible across Central MN. 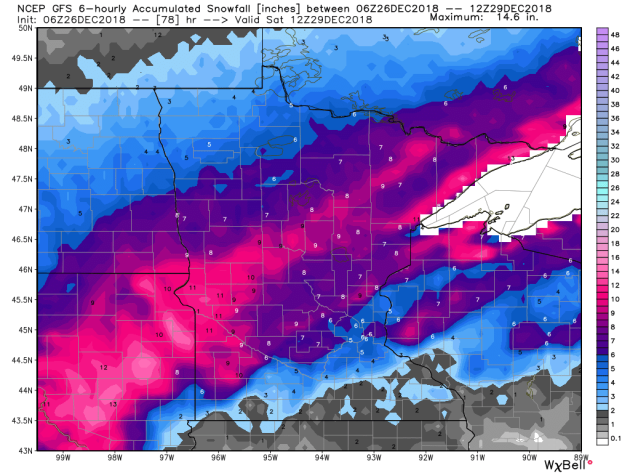 Note that these models also suggest that the Twin Cities will largely get missed by the heaviest stuff, especially the south metro. However, if the storm tracks just a bit farther south, this heavy snow band could shift a little farther south as well and put the metro in the bullseye! 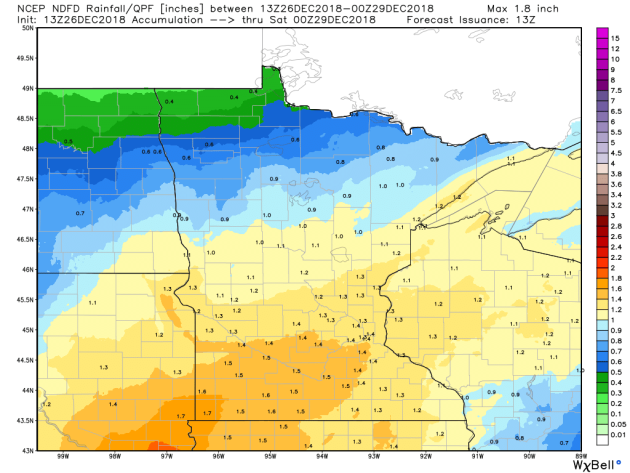 Seems odd to talk about rain in December, but this storm will bring warm enough temps to keep much of the precipitation in the liquid for across much of southern Minnesota. Here's a look at total precipitatoin in the liquid form through the end of the week. Note that areas in southern Minnesota could see up to 1.5" of liquid (again mostly in the form of rain), while the Twin Cities will see nearly 1" to 1.5" of liquid from this storm which will fall in the form of rain and snow. High temps across the state on Thursday will range quite a bit depending on where you are. Note that it'll warm into the low 40s across the southeastern part of the state, which will keep much of the moisture from the storm system in the form of rain. There will be a mixture of rain and snow across the middle part of the state where temps will be closer to freezing, but those across the northern part of the state will see all snow as temps stay at or below the freezing mark. 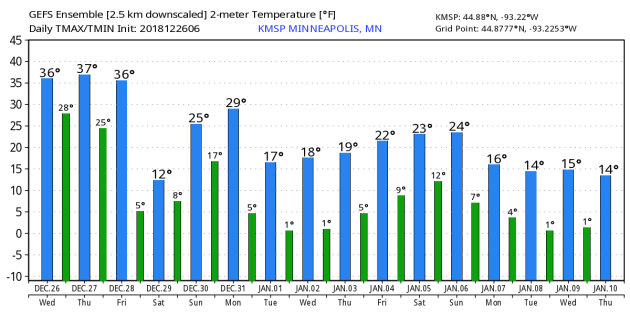 The average temperature in the Twin Cities is running nearly +6 degrees above average this month and it looks like temps will continue at above average levels through much of the week ahead. However, we are getting indications of a bigger cool down as we approach the new year and into the early part of 2019! According to NOAA's CPC, the extended temperature outlook from December 31st through January 4th suggests cooler than average temps working back into much of the Lower 48 with the exception of the Southeastern US. "How To Tell If Your Symptoms Are The Flu Or Just A Cold"
"The flu and the common cold are nasty respiratory illnesses with some similar symptoms. Here’s how to tell the difference. In the winter literally everyone seems to be getting sick. Your coworker won’t stop coughing and your kid keeps coming home from school a snotty mess, and a box of tissues barely lasts you one day. Contrary to popular belief, cold weather does not make you sick — but respiratory viruses (namely, influenza) do tend to peak during the fall and winter. In the US, flu season typically lasts from October to March. However, a nasty case of sniffles and aches during the winter doesn’t always mean you have the flu. Often, it’s just a cold, which you can get any time of the year. The common cold and flu are both contagious respiratory illnesses that can make you feel miserable, but they are caused by different viruses. Some flu symptoms may mimic a cold, but the flu tends to be much more serious and deadly — so it’s important to know the difference between these two illnesses. Obviously, only a doctor can diagnose you, but knowing how to recognize symptoms is always helpful. So how can you tell if your symptoms mean you have a cold or the flu, and what is the best treatment? We spoke to Dr. Tania Elliott, an allergist and immunologist at NYU Langone Health in New York City, to find out." According to Pollen.com, the Cold and Flu forecast suggests that we will be running at medium-high levels over the next few days. Wash your hands!! "14 Ways to Avoid Colds and Flu"
"Are you avoiding your co-worker with that hacking cough, cold, or flu in the cubicle next to you? Do you draw your hand back from every doorknob? Have cold-and-flu phobia? Get a grip before the grippe gets you. Weve consulted dozens of medical experts to bring you 14 ways to avoid colds and flu this season. Every time you shake someones hand, wash yours: But dont stop there. 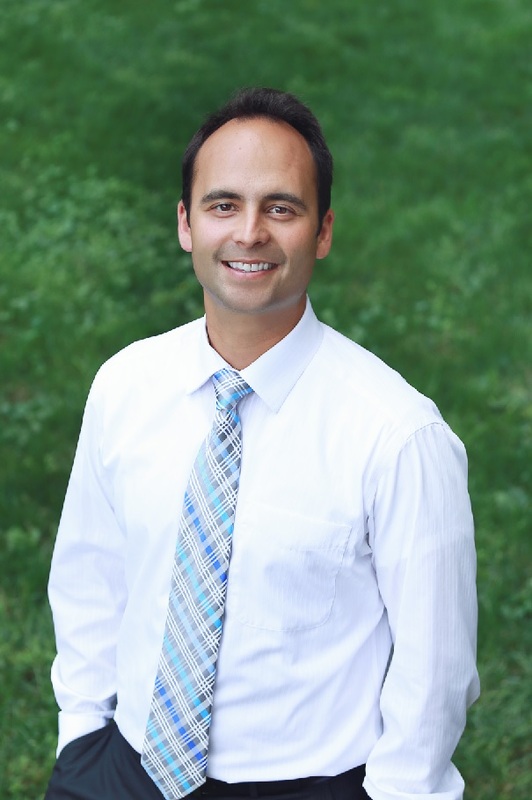 Wash them as much as possible, says Mark Mengel, MD, chair of community and family medicine at Saint Louis University School of Medicine. Running lots of water over your hands will dilute any germs and send them down the drain. Keep your hands off: Touching your nose and your eyes may hurt you, Mengel says. Those are the most common places for germs to get in." "Here's how to get rid of a cold fast"
"It's the time of year when colds are commonplace. As the weather gets colder, and you're more inclined to spend more time indoors with others, the combination of confined spaces, weakened immune systems and recirculated air means that, at some point or another, you're likely to become victim to one of the 200 viruses that cause the common cold. It's likely then, that knowing how to get rid of a cold fast is a priority this winter - no-one wants to feel miserable, sickly and extra tired over the festive period. This year, let's put a halt to that streaming nose and feeling like the Walking Dead because actually, you don’t have to suffer and sniffle in silence. Simply bookmark this cold-busting guide, now." Recent mild December weather has made for fairly unsafe ice condtions across parts of the state. The MN DNR has some basic guidelines on how thick the ice should be before you even think about stepping out onto the ice! Also remember that ice is NEVER 100% SAFE! So here we are, 6 days after the Winter Solstice, when the sun is lowest in the southern sky, staring out our windows at...rain? Swimming in an endless sea of statistics, one nugget stands out from Minnesota climate historian Mark Seeley. He told me the number of mid-winter rain and ice events in Minnesota has quadrupled since 2000. Exhibit A: a late December snow sandwich for the Twin Cities. Starting and ending as a little snow, with a cold rain sandwiched in-between. Today's rain will melt much of the snow that fell overnight. 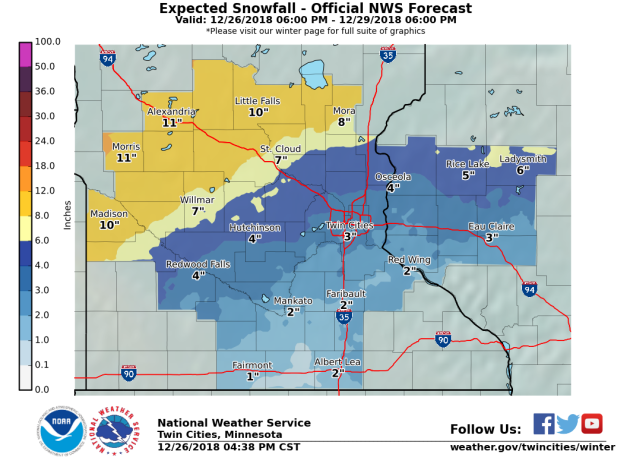 A couple inches of snow at the tail-end of the storm Thursday night may decorate metro lawns, but the Golden Snow Shovel Award goes to west central and central Minnesota, where a ribbon of 6-12 inches may pile up. Much of northern Minnesota picks up a cool 4-8 inches. Snowmobilers, cross country skiers and kids of all ages should be happy. A relatively quiet weekend gives way to a Monday burst of snow. By the middle of next we may wake up to subzero chill. 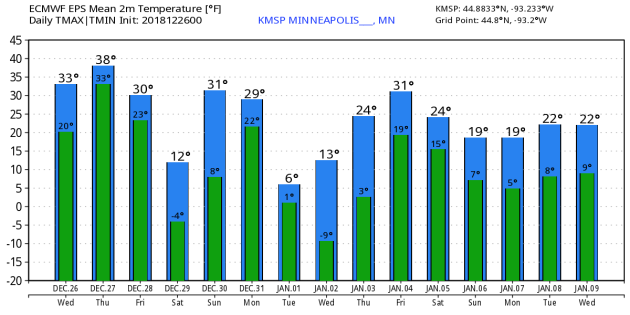 Embrace the numb because a puff of Pacific air thaws us out by late next week. THURSDAY: Mostly rain for the Metro with some icy patches. Winds: E 10-20. High: 36. THURSDAY NIGHT: Rain/snow mix. Slushy coating possible. Winds: NNW 15-30. Low: 26. FRIDAY: Snow tapers. Travel slowly improves. Winds: NW 15-25. High: 27. SATURDAY: Partly sunny and brisk. Winds: S 5-10. Wake-up: 8. High: 18. SUNDAY: Light snow farther north. Breezy and milder. Winds: SW 10-20. Wake-up: 10. High: 33. NEW YEARS EVE: Light snow or flurries. Couple of inches? Winds: N 10-15 Wake-up: 24. High: 29. NEW YEARS DAY: Bright and brittle sunshine. Winds: NW 7-12. Wake-up: 4. High: 8. WEDNESDAY: Cold start. Clouding up. Winds: S10-15. Wake-up: -2. High: 25. 1982: A snowstorm starts across the state, and ultimately dumps 16 inches in the Twin Cities by the time it ends on the 28th. "Tonight, look for the Northern Cross. It isn’t as famous as its counterpart – the Southern Cross – visible from the Southern Hemisphere or the northern tropics. But the Northern Cross also looks like a cross, and it’s pretty easy to spot. It’s a large, noticeable star pattern. The star Deneb marks the top of the Northern Cross, and the star Albireo marks the bottom. Tonight you can find the Northern Cross shining fairly high in the west at nightfall, as seen from mid-northern latitudes. It sinks downward during the evening hours, and stands proudly over the west-northwest horizon around mid-evening." High temps across the country will still be running above average across the eastern half of the country thanks to a large storm system moving through the Central US. However, temps behind the system will fall to well below average levels. A large storm system will continue to intensify as it moves into the Central US over the next could of days. 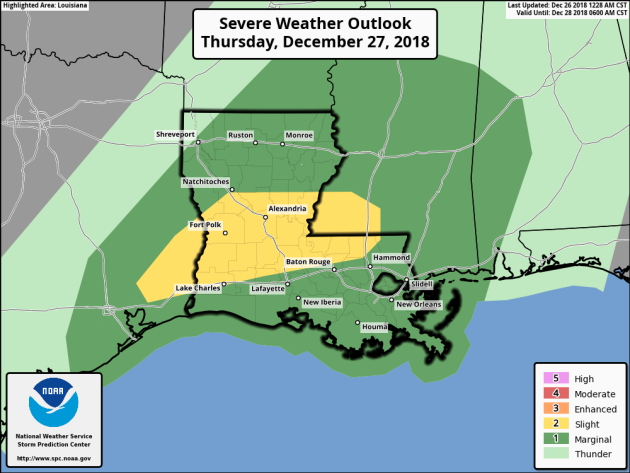 Strong to severe storms along with heavy rain will be possible in the Southern US, while areas of heavy snow and freezing rain will be possible from the Plains to the Upper Midwest. According to NOAA's SPC, there is a SLIGHT risk of severe storms across parts of the Southern US. Keep up to date with latest forecasts here if you have travel plans then. According to NOAA's WPC, the 7 day precipitation potential suggests heavy precipitation continuing across the Western part of the country, but take a look at the heavy moisture moving into the Central and Southeastern part of the country as we head into the 2nd half of next week! Showers, storms and heavy snow will be possible later next week - stay tuned! "European Union Nations Unanimously Agree to Ban Single-Use Plastics By 2021"
"The European Union (EU) is playing no games with its waste. All 28 countries within the union agreed Wednesday to phase out single-use items like plastic straws and cutlery, as well as polystyrene drink and food containers, by 2021. The 10 items covered in the ban make up 70 percent of Europe’s marine litter, per the EU. A couple U.S. cities and even California have taken similar actions, but this is the largest move the world to eliminate single-use plastics the world has seen thus far. Countries like Australia and India have banned plastic bags, but none have yet to outlaw the sale of straws, forks, and knives. Now, we’ve got a whole coalition of nations that’s decided our pollution problem is so dire that drastic action is necessary. The ban is no surprise—the European Commission announced plans for the move back in May. The ball is just finally rolling! The European Parliament and Council must now approve this measure, and then member states will have two years to fully implement it. This ban should avoid the emission of more than 3 million tons of carbon dioxide and save the union 22 billion euros (25 billion USD) in environmental damage by 2030. Consumers will save money, too: an estimated 6.5 billion euros (7.5 billion USD)." "One of El Niño's key ingredients is missing"
"El Niño, the climate cycle in the tropical Pacific Ocean that can reconfigure weather patterns, is slowly but steadily building for 2019 — but there is a component of it that is still missing in action. Why it matters: El Niño events are one of the most consequential forces that can tip the odds in favor of particular weather patterns. But they require both unusually warm ocean temperatures in the tropical Pacific and changes in the atmosphere — and so far, the atmosphere hasn't changed. The big picture: El Niño events can make or break a ski season in the Western U.S. by directing storms across the southern tier of the country, and they tend to favor milder-than-average conditions in the Midwest and Pacific Northwest. They can also boost global average temperatures, adding to the influence of human-caused global warming, which acts on far longer timescales. During the past two decades, scientists have become adept at forecasting the onset and intensity of El Niño events. A telltale sign of El Niño's arrival is a sharp increase in equatorial tropical Pacific Ocean temperatures. Part of its definition is now being met, as sea surface temperatures in part of the Pacific have reached 1°C, or 1.8°F, above average for this time of year." "This AI Just Mapped Every Solar Panel in the United States"
"2018's deadly hurricane season, visualized"
"Over the span of just 70 days, 22 major hurricanes struck land around the Northern Hemisphere in 2018. They began earlier, continued later, and some took unexpected paths before hitting land. Between record-breaking hurricanes in both the Atlantic and Pacific, billions of dollars in damages were seen. All told, 2018 was one of the most active hurricane seasons on record, and some studies are speculating that a warming climate may be making these storms more frequent and more intense. A number of factors, however, can determine the strength of a hurricane when it hits land. Over the course of weeks, tropical storm systems must gather strength, survive wind shear, and pass over land obstacles before striking land as a hurricane." "Where, exactly, is the edge of space? It depends on who you ask." "ASK SOMEONE WHERE outer space is, and they’ll probably point at the sky. It’s up, right? Simple. Except, no one really knows where “air space” ends and “outer space” begins. That might sound trivial, but defining that boundary could matter for a variety of reasons—including, but not limited to, which high-flying humans get to be designated as astronauts. Now, with Virgin Galactic seemingly on the cusp of launching paying passengers onto suborbital trajectories, many people are wondering whether those lucky space tourists will earn their astronaut wings. As of right now, they will, according to U.S. practices. Is that a problem? “No, I think it’s great!” says NASA astronaut Mike Massimino, who helped repair the Hubble Space Telescope. Here, we take a look at the ways space is currently defined, the confusion surrounding the demarcation, and what the future might bring." "Scientists slam door on the alleged 'pause' in global warming"
"Today, climate change deniers will resurrect the tired old argument that Earth's global warming stalled sometime at the beginning of this century. The evidence for such a slowdown, however, doesn't exist. A diverse group of global researchers published two papers in the scientific journal Environmental Research Letters on Tuesday, affirming why such claims of a global warming hiatus are and always were misleading, at best. "We find there never was any statistical evidence for it," Stefan Rahmstorf, head of Earth System Analysis at the Potsdam Institute for Climate Impact Research and coauthor of the research, said over email." Winter storm update: Warnings are being issued for parts of Minn.